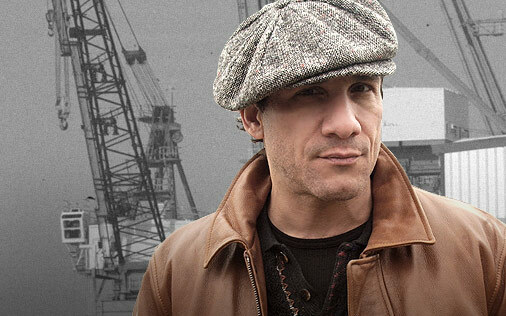 From as early on as season 2 of The Wire it’s clear to see that this show is going to be a crime epic. The second season shifts the focus to a completely different side of Baltimore, the port and the stevedores that work there. The main focus of the second season is on the port and the dirty dealings going on there. The man in charge of the union and perhaps the main focus of this side of the series is Frank Sobotka. Frank is one of my favourite characters, he may be dealing on the side and smuggling goods off the dock but he does it with the unions best interests in mind. The main theme of this season seems to be the changing times and the advancement of technology. Frank knows his men on the pier and the docks are soon going to be obsolete so he steals and smuggles to keep the union afloat. He is aided by his nephew Nick and both of them constantly have to deal with Franks screw-up son; Ziggy. The so-called “bad-guys” of this series is a group if Greek criminals headed by a man known only as “The Greek”. It is for the Greeks that the Sobotka’s steal for. It is when one of the boxes they’re stealing contains 14 dead European prostitutes that the proverbial really hits the fan. One of the Greeks; “Spiros Vondas”. These new characters are some of the strongest characters I’ve seen on television. I absolutely loved Frank Sobotka and the troubles he faced, you empathise with him and see how he might have ended up in this situation. And in the end he’s just a man who loves his family. The story of Frank Sobotka is a tragic one and is an immensely emotional ride. Nick Sobotka is a strong character as well, although he lacks the every-man sort of charm that made Frank so likable. He’s still a strong character though, it just takes a bit longer to feel for him. Ziggy is the one that seems to divide the audience, I’ve seen many online calling him annoying. Personally I found him annoying at first but I felt it was on purpose, he screws up and people constantly bully him and treat him like dirt but this just makes his inevitable snap all the more satisfying. The Police side of this season comes about when a senior Police Chief has a problem with Sobotka. He gets Lt Daniels on the case and soon they start to unravel a whole lot more. With the return of Lt Daniels we also get the return of Kima, Herc and Carv. As well as Pryzbylewski and Lester. Homicide gets involved upon the discovery of the prostitutes but McNulty is nowhere in sight. He is still on the boat, a Marine Port officer after his punishment at the end of season 1. He finds a body which possibly connects to the prostitutes and the first half of the season involves him struggling to let her go. He wants to find justice for this woman and not let her be remembered as “Jane Doe”. There’s a subplot running throughout the series about the Barksdale family in prison. This reminded me of how great a character D’Angelo Barksdale is. He wants to get out of the game but his uncle Avon doesn’t want to hear it. D’Angelo is clever and it’s a sad story for him in this season. With Avon Barksdale in prison however, it’s up to the amazing Stringer Bell to deal with things his way. And his way is often much more ruthless. Idris Elba as Stringer Bell remains one of the most constantly watchable faces on TV. He is so good. Season 2 introduces us to new characters like the brilliant and quiet Brother Mouzone and the return of favourites like Bubbles and Omar. I’ve heard people say that season 2 is the weakest of all 5 seasons, but I don’t see how that is possible. I preferred it to 1, mainly because I found the story of the Sobotka’s so engaging. The rise and eventual fall of the family is tragic but I couldn’t stop watching, ending up watching the last half of the season in one day, back to back. It’s that sort of addictive series, a series that you can’t wait to watch more of. I was disappointed when I looked outside realises it was 5 o’clock in the morning, knowing I couldn’t watch any more for another day. If my review didn’t convince you (then what’s wrong with you?!) then let this one do it. I feel sorry for people who haven’t seen this series, it really should not be missed. I’ve just seen the Seasons 1,2 & 3. Season 2 is my favorite. Best music/title track; best supporting actors; best storyline. The “Greeks” and Sergei are impressive; they look more shifty, sinister and threatening for me than all those black local gangsters in town. Also the Sobotkas – even Ziggy in his most bizarre moments – appear always genuine and authentic. I can’t say this about Brother Mouzone , or about an over-stylized Marlo Stanfield in Season 3. (And the upcoming new mayor, Tommy Carcetti, therein is too polished; for me, one of a very few boring characters of the show). All in all, Season 3 is not bad; it has some great moments. However, I consider Season 3 too jumpy. The storytelling in Season 1 & 2 is more compelling and careful. I have not seen the Seasons 4 & 5 yet. Many put Season 4 on top, followed by Season 3.